If I had my way, this shirt would have been much higher up the list... probably not Top 10, but somewhere just outside. This is the trouble with democracy - you have to take other people's opinions into account. Rather than be a weakness, I believe this divisiveness is one of this shirt's greatest strengths. With kit life-cycles now generally being no longer than one season, we live in a world with thousands of forgotten designs... kits that did the job, but passed us by, never to be remembered. On the flip side, we have shirts such as Warrior's Liverpool 'Horace goes skiing' / Space Invader efforts. Truly divisive shirts, albeit with the majority in the 'burn it' camp, but even now, several seasons later, we still remember them. Anyone recall the LFC away shirt from the season before? Or after? And so it came to be that, despite being one of my all time favourite shirts, it languishes here at 33. As for the shirt itself, the idea is certainly not new. Quite a few shirts have had similar prints. 1860 Munich and Fenerbahce both have shirts in their locker with all-over prints bearing imagery from the club or town's culture, albeit as the inside print in a reversible shirt... so what makes this one my favourite? Aside from the fact that blue is my favourite colour and I think gold works beautifully with it (the Italy '06 shirt with its mid / dark blue hues and gold numbering was the one that rekindled my love of shirt design), this outfit arrived at a time when French clubs were getting some truly outrageous designs. 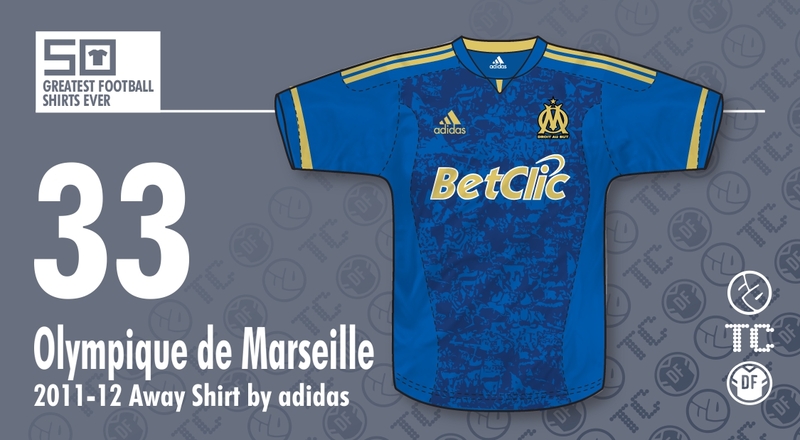 Adidas, while giving English clubs mostly dull templates, were serving up some truly original (some would say awful) shirts - in particular Lyon and Marseille - and this remains my favourite of that era. Rendered in a gorgeous tone of blue, with all trim, right down to the crest and Adidas logo, in gold, it has a luxury (some would say gaudy, but they would be wrong) feel to it. But what makes it for me is that print. Depicting images of the club's and moreover, its fan's cultural heritage, it turns a run of the mill shirt into something special... though clearly not that special for John, Chris and Jay.